The latest Teenage Mutant Ninja Turtles film released in theaters a couple of weeks from today, and the newest Turtles game, published by Activision and developed by Platinum Games, released late last month. It's a totally tubular time to talk about some of the heroes in a half shell's best entries, from fighting games to the genre the Turtles' best excelled at, the beat-em-up. 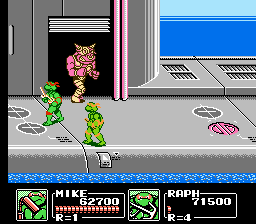 These five Teenage Mutant Ninja Turtles video games will have you shouting "Cowabunga!" with their quality. Back in the '90s a lot of publishers were chasing after the money that Street Fighter II claimed by creating a various amount of 2D fighters. This was true as well for Konami and Teenage Mutant Ninja Turtles, and their offer to the fighting game formula was none other than Teenage Mutant Ninja Turtles: Tournament Fighters. I'll be referring to the Super Nintendo version, despite their being Sega Genesis and NES versions, as the SNES one is the best of the three. 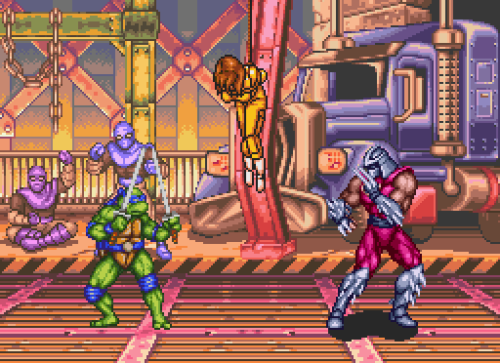 Combo-based fighting goodness with the Ninja Turtles performing Hadouken and Shoryuken-like moves, characters like Chrome Dome, Wingnut (from Mutanimals fame), and Armaggon (from Archie Comics fame) expanded the colorful roster of characters, and the music remains absolutely rockin'. A fantastic fighter that's quite unappreciated, Teenage Mutant Ninja Turtles: Tournament Fighters for SNES is not to be missed. 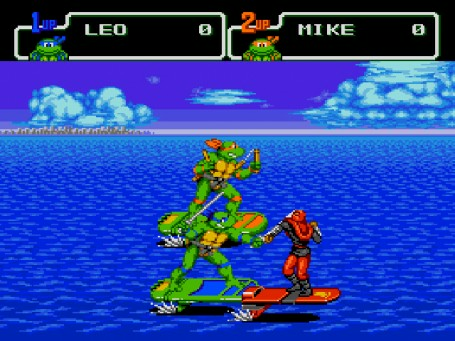 A 2D beat-em-up which brought the Ninja Turtles to the sunny beaches of Florida before having their vacation ruined by yet another Shredder plan (Bummer, dudes! ), Teenage Mutant Ninja Turtles III: The Manhattan Project saw the theft of the island of Manhattan by Shredder and Krang. It was up to the Turtles to put Shredder (and Manhattan for that matter) back in its place! 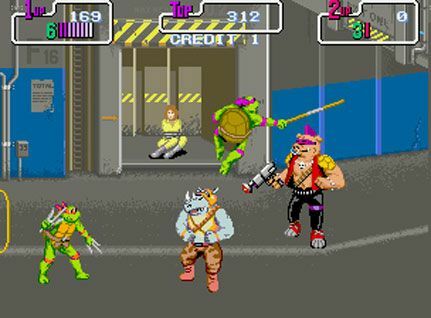 Featuring encounters with traditional foes like Bebop and Rocksteady, The Manhattan Project also offered battles against foes from Teenage Mutant Ninja Turtles' toy line, including bosses like Groundchuck and Dirtbag. Levels ranged from beach boardwalk beat-downs of Foot Soldiers to ocean-hover surfing goodness. 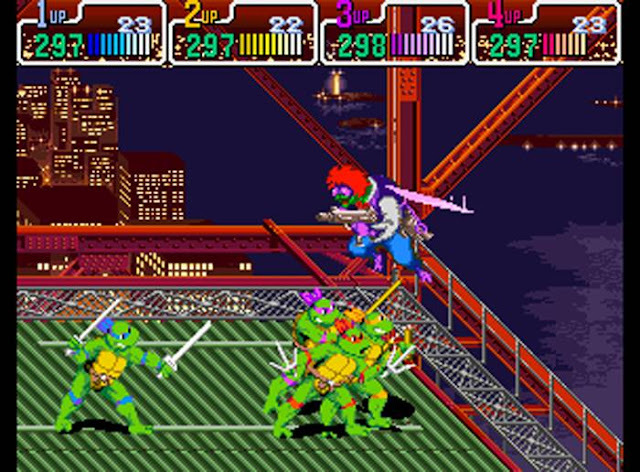 The first Teenage Mutant Ninja Turtles for the Sega Genesis, Teenage Mutant Ninja Turtles: The Hyperstone Heist was that console's answer to Turtles in Time, even featuring several elements of the game like the same combat (albeit without being able to toss foes at the screen) and even some levels verbatim. 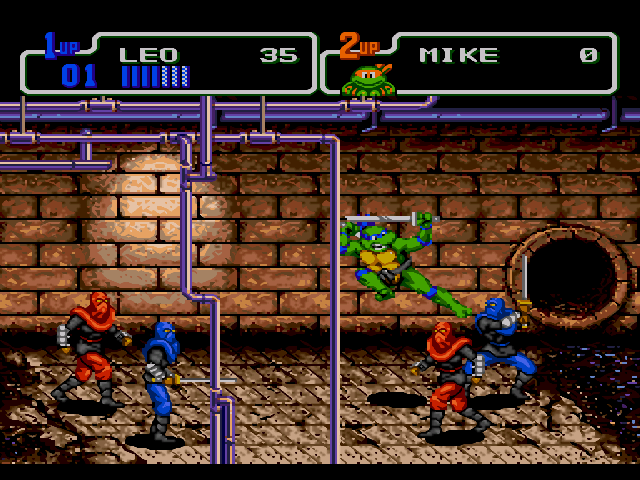 Though Hyperstone Heist possesses less levels than Turtles in Time, the levels that it did have were lengthier affairs, many of which were entirely original to the game. 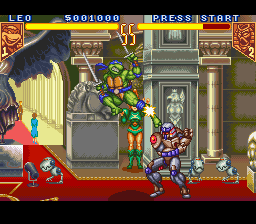 Compared to the SNES version of Turtles in Time, Hyperstone Heist featured richer backgrounds with more layers to them, crisper and faster sprites, and tougher enemy AI. Though it overall didn't win over Turtles in Time, Teenage Mutant Ninja Turtles: The Hyperstone Heist is still a game Turtles fans shouldn't overlook. 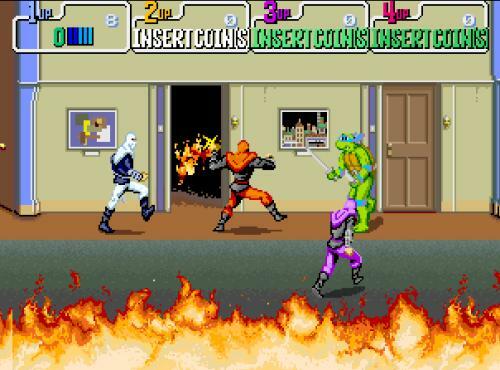 The first arcade game, eventually released on home console marketplaces last generation, Teenage Mutant Ninja Turtles' 1989 arcade romp had it all-- engaging levels from city streets to bridges, boss battles against foes like Bebop and Rocksteady to Baxter Stockman, and fun multiplayer for up to four players to take down Shredder's forces. A home version for the NES released, giving players the ability to enjoy a visually watered down version of the game, albeit with two special and exclusive levels to the home console version. 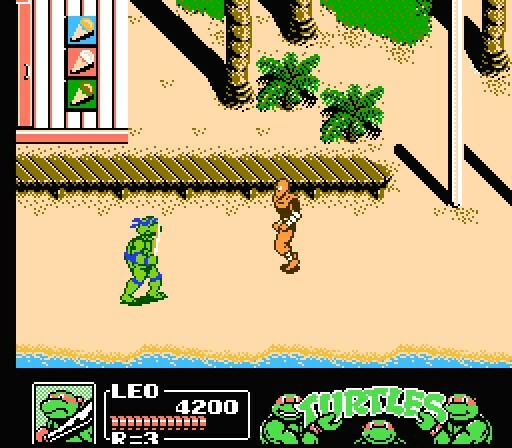 It was Teenage Mutant Ninja Turtles '89 that established the heroes in a half shell as beat-em-up all-stars, and the fun would continue on for years to come. Go back to the past, present, and future (i.e. be the Turtle equivalent of Marty McFly) in the most popular Teenage Mutant Ninja Turtles video game to have ever released. 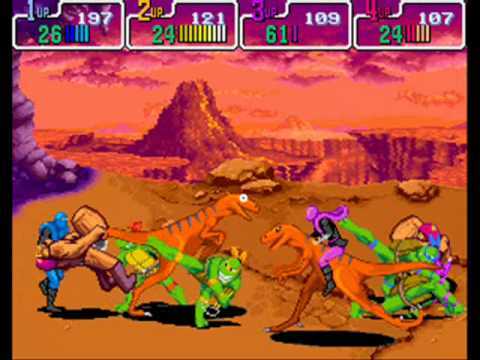 Another game that ate up quarters like ninja turtles gobbling up whole pizzas, Turtles in Time offered up the best combat in the series, allowing players to take down Foot Soldiers and other foes in a variety of ways with up to four players in the arcade version and two players in the Super Nintendo port. There's no better feeling than chucking a Foot Soldier at the screen. Alley-oop! With a wide range of locales and levels, featuring epic boss battles, Teenage Mutant Ninja Turtles IV: Turtles in Time remains the favorite Ninja Turtles game for a lot of fans, especially those who were kids in the 90's.